I’ve just come back from a week in Scotland, where I stayed in a log cabin in a little village near Pitlochry in Perthshire. 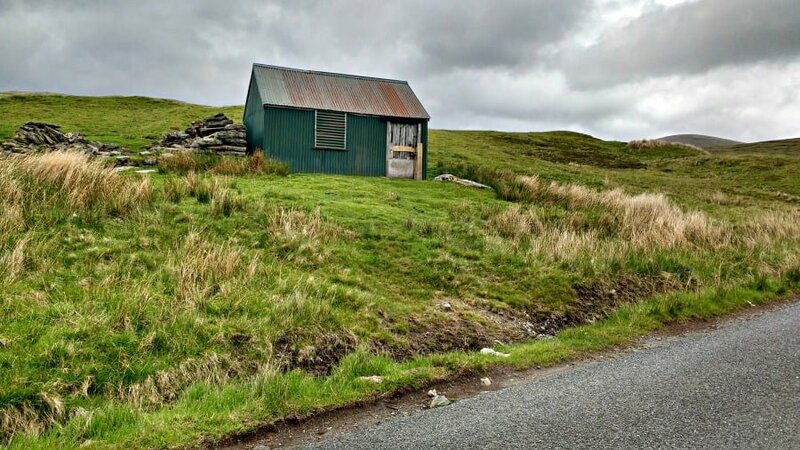 My husband is half Scottish, so he has been telling me we need to go and visit the motherland for a long time – but for one reason or another we’ve never made it up there. What did I love about Scotland? The main thing I loved about it was the scenery. As soon as we crossed the border from England I noticed the scenery just getting bigger. Hills turned into mountains, woods turned into forests, the rain started (well, of course it would) – and suddenly I started feeling very calm and relaxed as we approached our little riverside log cabin. 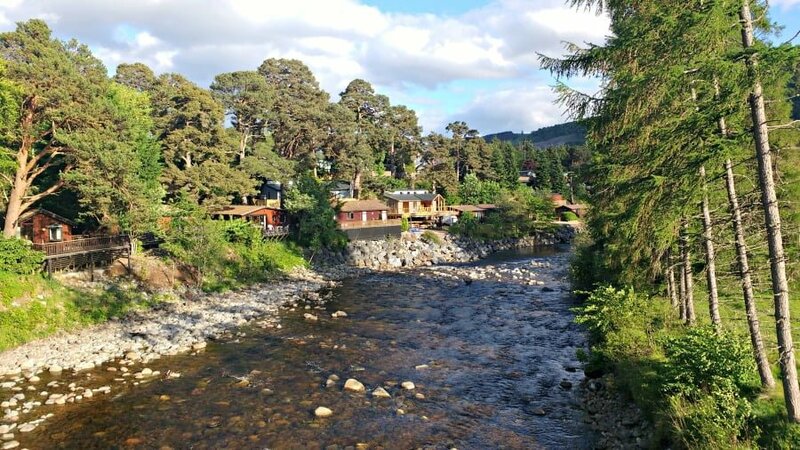 We stayed in a cozy 2 bedroom log cabin in a quiet holiday park in a little village called Blair Atholl in Perthshire. 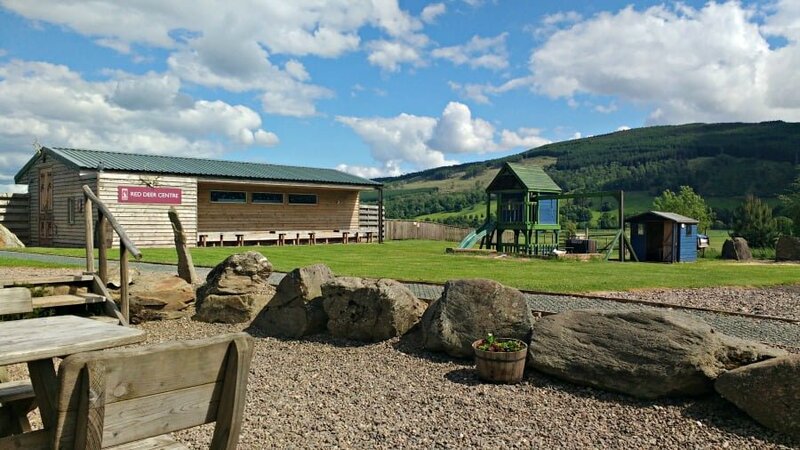 The log cabin was great for us – really well furnished, with a large decking area outside for the boys to play on, parking space below and with spectacular views over the Cairngorm Mountains. There was a river just across the road, which the boys loved throwing stones in and a very tasty fish and chip shop 5 minutes away. A travel cot and highchair was included too. 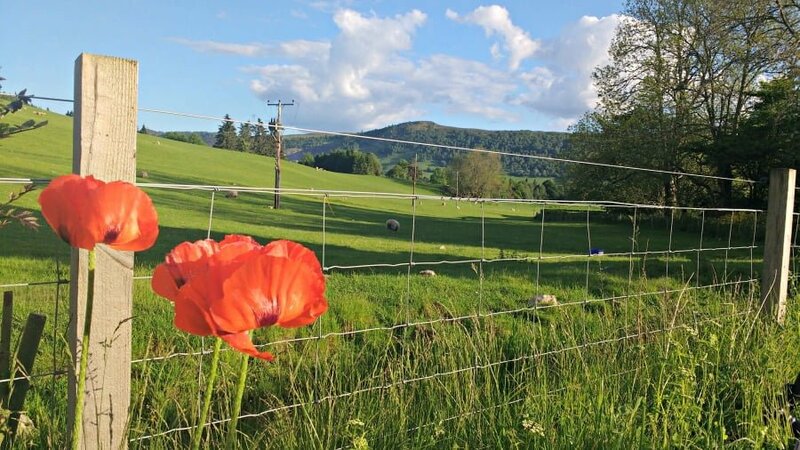 Before I visited Scotland, I had some preconceived ideas about what I thought a holiday in Scotland was like, but the reality was very different. This is what I thought I holiday in Scotland would be like. Ok, so it does rain a bit in Scotland – I’m not going to deny that, but the rain helps to create a wonderfully lush, green landscape with crashing waterfalls and full lochs. It didn’t rain as much I expected when I was there. Temperatures were in the late teens to early twenties, and the evenings were long as it didn’t get dark until 11pm. The Scots are geared up to deal with rain with plenty of things to do inside, and patio heaters and blankets to take the chill off the evening mountain air. And when it doesn’t rain, Scotland is incredible! 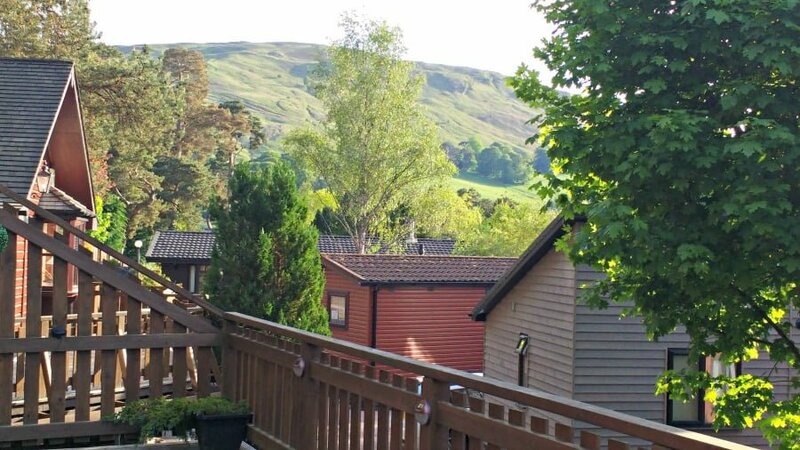 It took us 5 ½ hours to drive from our home in Yorkshire to our log cabin in Blair Atholl. This sounds like a lot, but it was better than I thought and we managed to do the journey with just 1 stop. The boys watched DVDs in the back, and we stopped off in Moffatt for a run around the park, play in the playground and to eat our picnic. The good thing about driving to go on holiday is that you can pack loads. We had our bikes on the top of the car, some basic kitchen store cupboard essentials, and the boys took some toys too. We got there at tea time – just in time for when the fish and chip shop opened. False! We ate out at lunchtime every day on our holiday, and were pleasantly surprised about how good the food was, and also what good value it was too. Food is an important part of a holiday for me, and I love trying new food and local dishes and Scotland exceeded my expectations. Every place we went to had a kids menu, and thankfully there were no chicken nuggets in sight. The kids had smaller portions of the adults menu, which was generally freshly prepared locally sourced food. 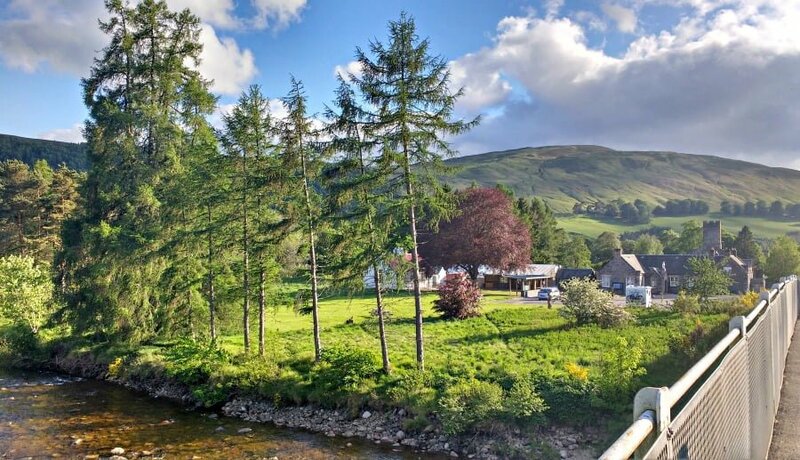 One of our favourite places to eat was The Watermill at Blair Atholl which was a working watermill with a tea room and bakery. 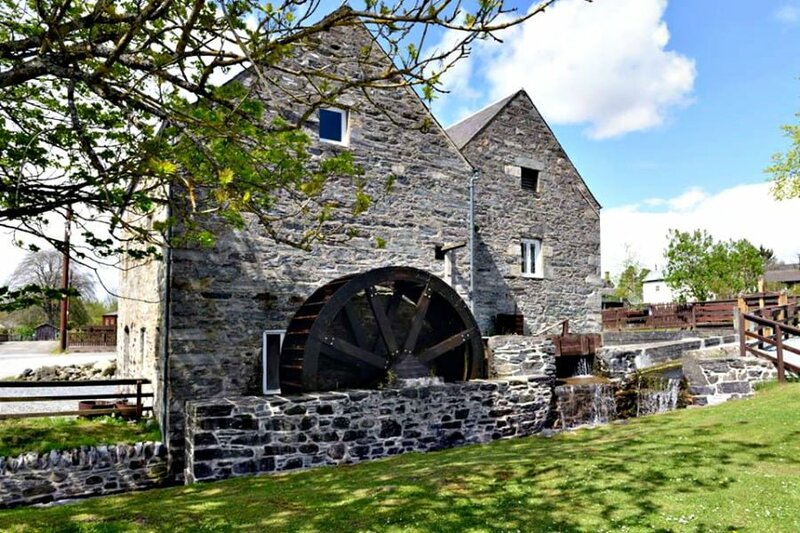 The freshly baked scones, bread and cakes are made using the mill’s own flour, and afterwards you can have a look around the mill and see the flour being made. Children can even have a go at grinding their own flour. We also loved the Habitat Café at Aberfeldy. After a morning spent exploring the amazing waterfalls around Aberfeldy, this was the place we retreated to for our lunch, and it was well worth it for the food, ambience and of course the cakes. I recommend the poached pear and halloumi salad and my husband loved his haggis burger. 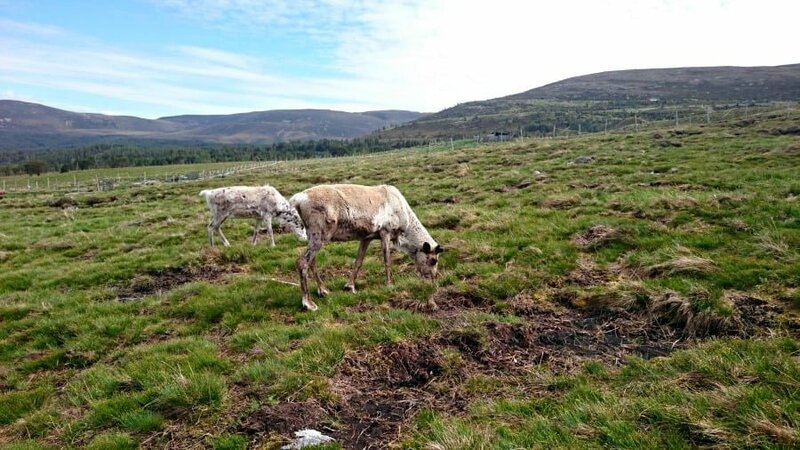 Sometimes cafes at family attractions can serve very mediocre fast food, but not so at Highland Safaris near the village of Dull (twinned with Boring in the USA). 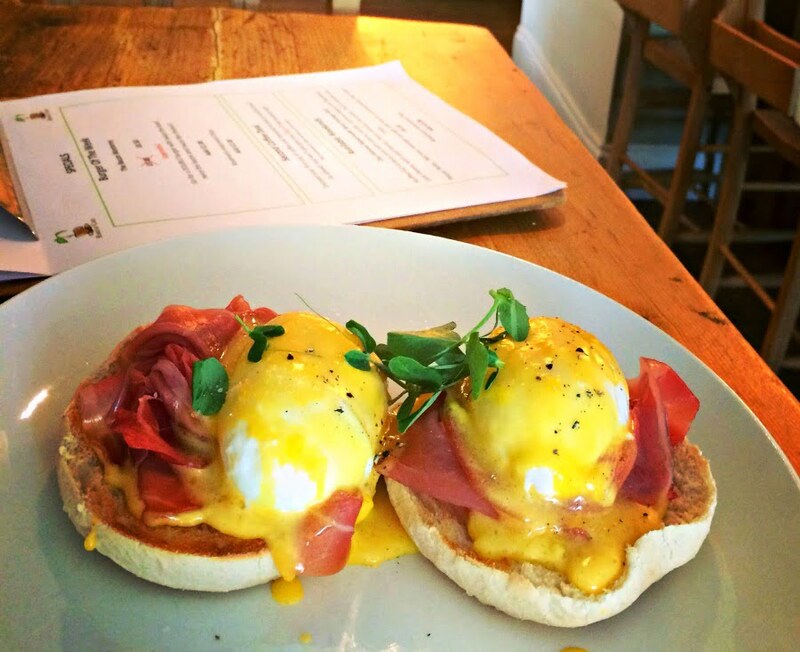 This is another gem with an extensive menu serving excellent value fresh food in a cozy highland themed setting. And you get to see the Red Deer afterwards. Finally, after a morning spent hiking up a Cairngorm mountain feeding reindeer, it was time to feed ourselves. 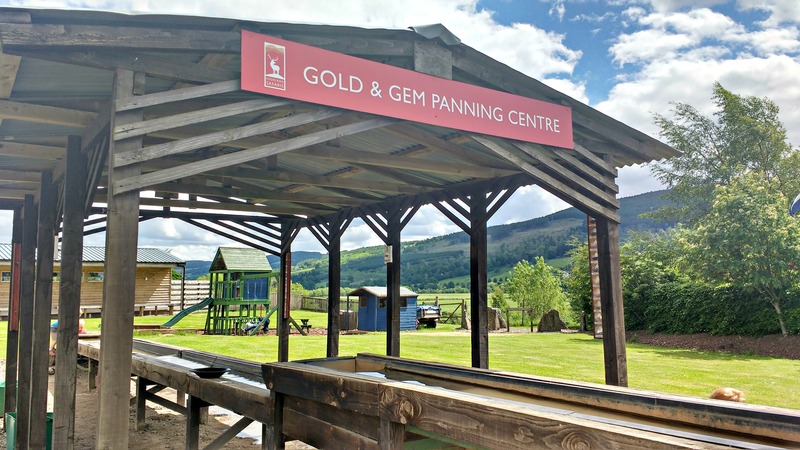 We headed to the Café at the Forestry Commission’s Glenmore Forest and again, were really impressed with the range and quality of the food served. I had a bowl of chilli and a fresh salad and the boys had sandwiches – all finished off with cake of course. Even though the café was really busy, the food came out quickly and the staff were super friendly. One of the questions I got asked most when we got back from Scotland was ‘Were there loads of midges?’ I had heard a few horror stories about Scotland being overrun with midges, particularly after the mild winter we have had, so I had spent a small fortune on kid friendly insect repellents beforehand. 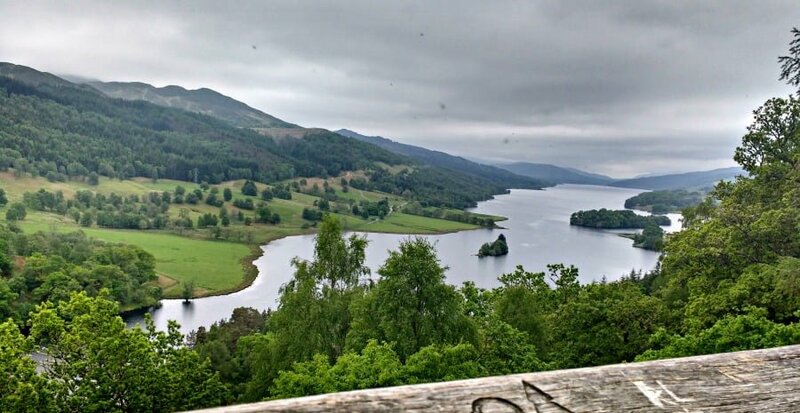 And after all that, we only saw midges at once place – the Queens View overlooking Loch Tummel. They were pretty unbearable, but as we hadn’t seen midges anywhere else, I hadn’t brought our insect repellent with us – typical! I don’t know whether it wasn’t the ‘midge time’ when we were there (end of May / beginning of June), or whether there aren’t midges in Perthshire, but our insect repellent stayed in the drawer during our holiday. We went during May half term and I thought it would be really busy. It wasn’t. It was peaceful with quiet roads, nicely busy attractions and a chilled out vibe. Along with the long light nights, it was a great time to go to Scotland. 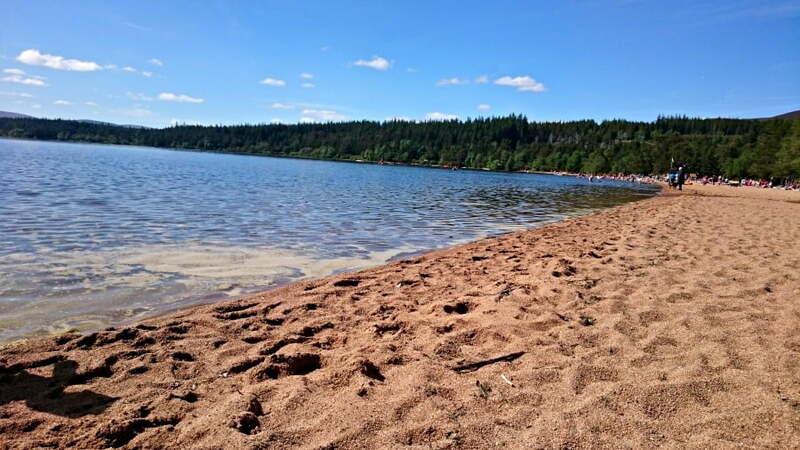 This is the beach I spent an afternoon sunbathing on whilst the boys splashed and swam in the loch. 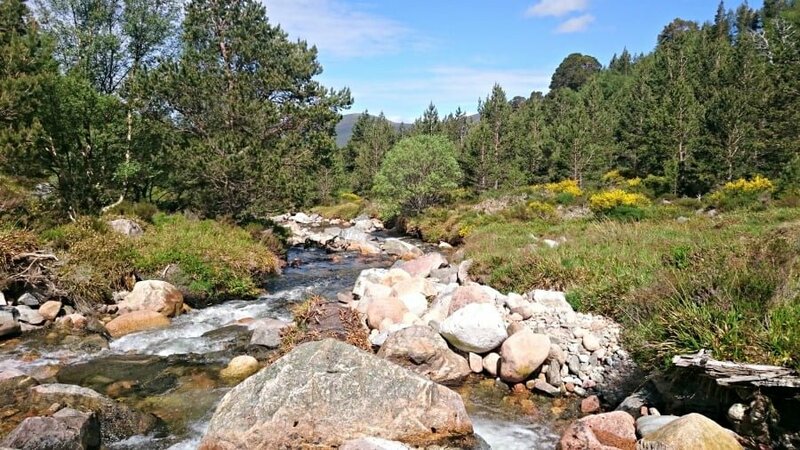 I show everyone this photo and no one can believe it is Scotland. 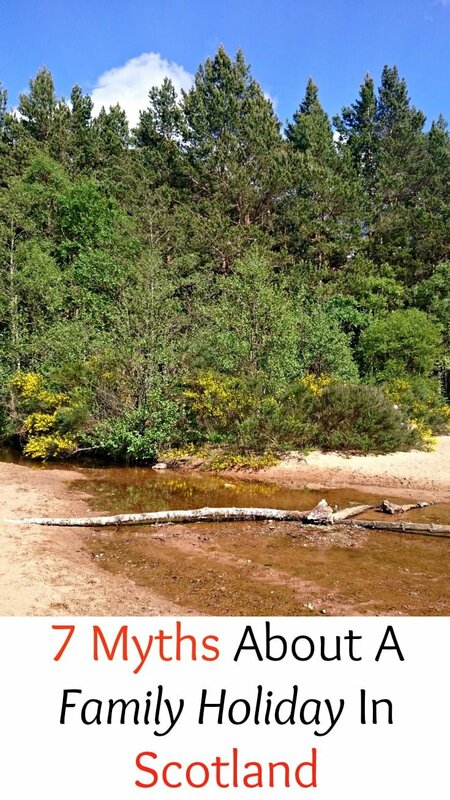 This beautiful beach is at Loch Morlich, near Aviemore and I couldn’t believe how stunning it was. 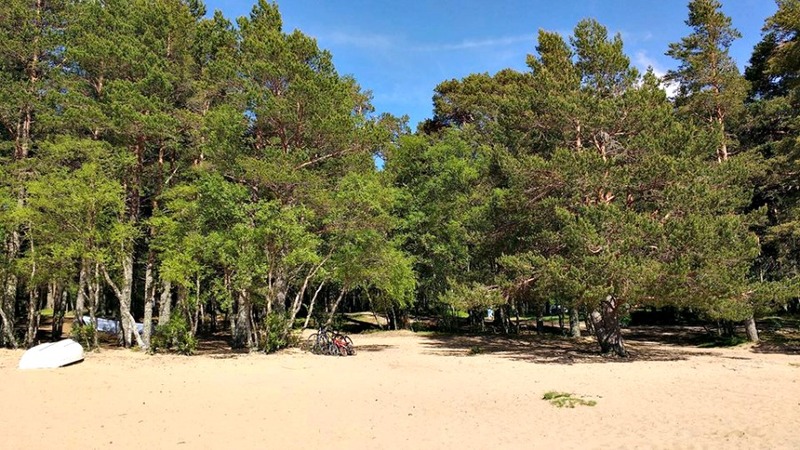 The loch was surrounded by pine forests and snow-capped mountains, and there were people with kayaks and paddleboats in the loch as well as plenty of swimmers. I honestly thought I was in the Mediterranean when I was lying there. There was an easy 3.5 mile bike ride around the Loch which we did in the early evening before returning to our log cabin for a bbq. So there you have it. I’m a Scotland convert and I’m already planning our next family holiday in Scotland. Anyone recommend any family friendly cottages in the Highlands?! That scenery is just stunning! How beautiful is that country?! We couldn’t agree more! We did a road trip around Scotland for 3 weeks when our eldest was just 5 months at Easter. We look back on that trip so fondly. 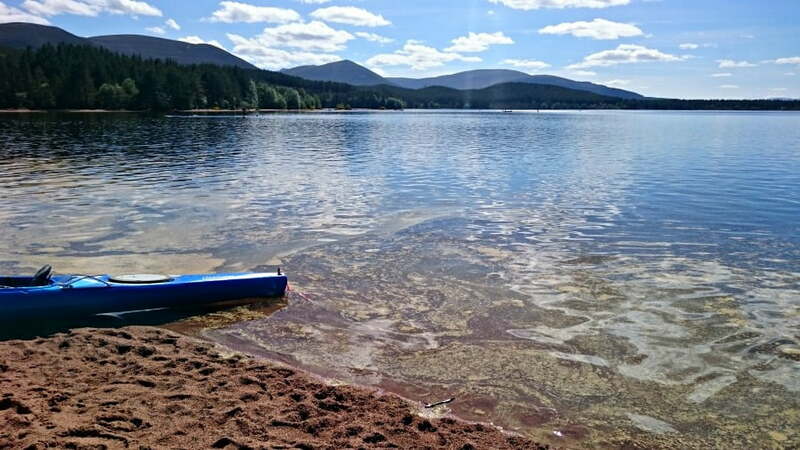 Scotland is stunning and we too had gorgeous weather at Loch Morlich. However, we returned to Fort William that Christmas and it gets dark before 3pm and the weather was just awful. A very different holiday… I think time of year and weather play a big part in how successful a Scotland trip is. Amazing! I didn’t know about a lot of these places. I’ve done Edinburgh and a bit of Glasgow but never really explored anywhere else. 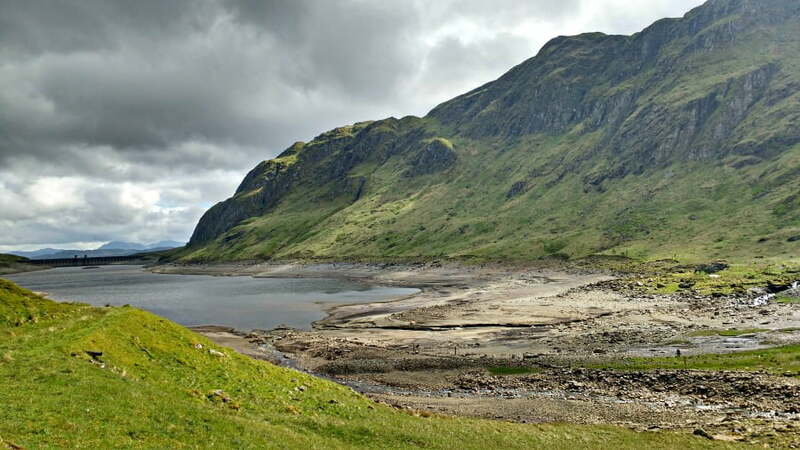 The loch beach looks fantastic!